TomTom is a name that is almost synonymous with SatNav devices and currently have no less than 11 systems in their portfolio. Normally we look at some of the devices towards the top of the range. This review looks at one of the entry level devices, the TomTom Start 20 with UK and Ireland mapping priced at �130. With a price tag of �30 more than the bottom of the range Start the Start 20 offers a 4.3" wide screen, advanced lane guidance and spoken street names (Text To Speech) as headline additional features over it's sibling. The device itself from an ascetic point of view is a better looking device with a more solid feel. Addendum 24Aug2011 In the last couple of days TomTom has released a new version of the TomTomSAapplication that connects the SatNav to your computer. This now allows POI content on your computer to be loaded onto the Start 20 making it possible to use the PocketGPSWorld.com Speed CameraDatabase or other POIs and get custom icons and audible warnings. Back in the good old days we used to publish items such as GPS chipset and processor type and speed, but in these days of mass market consumer GPS these details are deemed to be irrelevant. I suppose it is a sign of the times that the internal workings are not something we can use as a comparison to other products now. Our reviews thus become more observational than technical. This in a way is not a bad thing as we are looking at the user experience rather than the technology "behind the screen". However missing from the technical specifications is the fact that the screen is the older resistive style touchscreen. This gives a lower contrast, less bright display, but with reduced reflections. The device also contains a sensor to determine which way up it is with automatic screen viewing rotation. The windscreen mount is integral to the device, and is removable with a bit of effort. To remove the current one requires a good tug and a belief that you will not break anything. This is good for a number of reasons: the mount is unlikely to get lost; you can change to one of the alternate accessory mounts available from TomTom or third party providers. Essentially the mount point is a socket which fits a rubberised ball mount adapter. 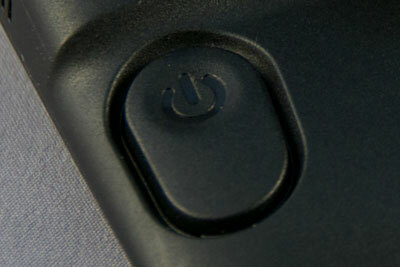 Power is supplied to the SatNav by one of the newer USB Micro connectors. The supplied cable doubles as an in-car and also computer connector. There is a cigar lighter power adapter with a standard USB socket for use in the car. TomTom point to point navigation. Strangely TomTom omitted to point this out in their literature. You do of course get the standard TomTom navigation with support for full postcode entry. This is an important factor as even today some systems do not support full postcode destinations. This is the technology that uses historical data from millions of users where the actual speeds on the roads have been recorded for more accurate timing, and faster routing at different times of the day. This replaces the map with a view of the junction with arrows clearly showing you the lane(s) you need to be in to help you make the turn or indeed stay on the correct road if you need to shift lanes. In old terminology this used to be called Text To Speech of simply TTS. TTS is used to create audible turn instructions that go beyond the "Turn Left", "Turn Right" and provide more useful information such as "Turn left into High Street". In theory this allows you to concentrate more on the road than having to check the screen for the correct turn. With parking assist you can route to a nearby car park rather than your entered destination. If you are heading to a specific place that has no parking facilities this will direct you to the nearest car park. If you have a problem this menu provides a number of options to help you clear your problem from breakdown assistance to police and health services. The SatNav has Speed Camera warnings built in. These require a subscription to provide regular updates to the service. It is also possible to add the PocketGPSWorld.com Speed Camera Database on to the device using the MyTomTom utility. As with all TomTom devices the Smart 20 allows you to update your map to the latest one within 90 days of buying the SatNav. 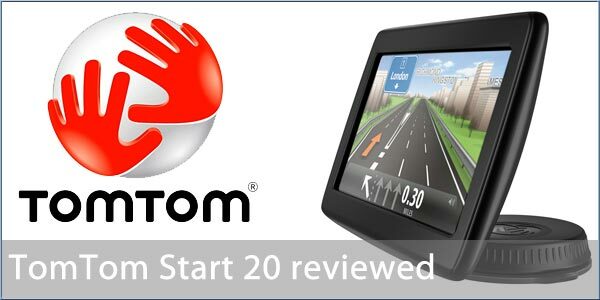 The first image of the TomTom Start 20 is the main screen. As mentioned above this is a 4.3 inch resistive touchscreen display. There is no branding on this face of the device, and also no controls. In fact when you look at the top left rear of the SatNav you will see that there is the single control: the power switch. This needs to be pressed and held for about 2 seconds to switch the TomTom on and off. In the top centre of the back is the rubberised ball leading down to the windscreen suction mount. 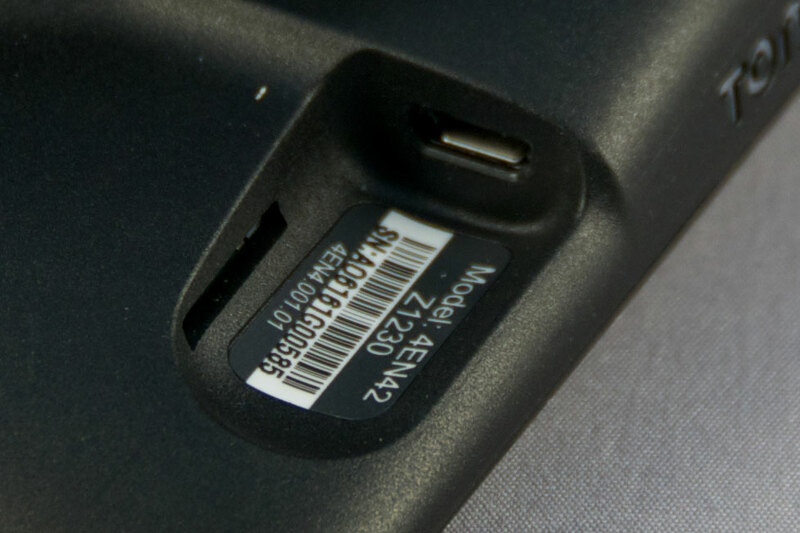 To the right at the top is the power connector, a micro USB socket. With the mount swivelled into the vertical the speaker for the audio output is revealed. Don't be fooled by the grill pattern here, the speaker is only about a sixth of the size of the grill. When you are transporting the SatNav out of the car the windscreen suction mount folds flat against the back of the device forming the slimmest possible profile. 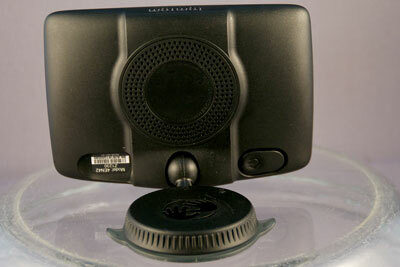 As mentioned above the mount can be pulled off the device and an alternate mounting accessory can be fitted. TomTom sell a dash mount and an air vent mount, but you can also buy a third party mounting systems. It is only when we come to the top and bottom of the SatNav that we actually see any branding. Interestingly these are identical alluding to the fact that these may be mounted in the car with the mount at the bottom or the top. In either aspect exactly the same look is shown to the user. The device is symmetrical. Well lets start with a simple route. To get started all you need to do is remove the TomTom Start 20 from the box, plug in the power adapter, mount the device on the windscreen, hold in the power button for a couple of seconds and then you are ready to go� Well not quite. There are a couple of setup options, such as language and home location that need to be entered, but after that and the obligatory demo screens you are ready to go. Now assuming you have done this outside in the car by the time you have gone through all that the SatNav will have had a little time to search for the GPS Satellites and will know exactly where you are. If on the other hand like a lot of people you will have done this in your sitting room then it is highly likely that the TomTom Start 20 will not have got a Satellite 'Fix' and will have you located at some random place in the country, probably your home address if you entered it. You should now be at the main screen. To select a destination, say Euston Tower NW1 3AS, tap on the map to access the menu. Next tap on the Address icon and enter NW13AS (with no spaces) and tap done. This shows the location screen with the option to find a nearby car park. Pressing select will warn you about toll roads (London Congestion Charge) before showing the route summary tapping done will start the navigation. As you start exploring the TomTom start you will very quickly become irritated by the "TomTom Tips" which incessantly popup whilst you are trying to do something. You can remove these in the settings, though they are hidden really deeply on the second page of the Advanced Settings, which are on the last page of the settings pages. Un-tick the tips option and you are all set. The route calculations are based on the current time using TomTom IQ routing technology. This creates a route based on the average road speeds at that time of day. There is a tab with a timer icon where you can change the time of departure and see how that affects the arrival time. Unfortunately the time can only be incremented in 15minute intervals so is only of use if you want to check your departure time for an imminent trip. If you want to check route times for departure points or different dates then you can use the plan route function. This is available from the main menu when you do not have a route planned. This defaults to the start and end points of your last route but allows you to change both. You can then select both the date and time of the journey before calculating the route and then fine tuning it. During route planning (and throughout the route) certain route information can be displayed: Show turn by turn instructions; Show map of the entire route;play a demo of the route; show the route summary; and show the destination detail. This allows you to have full information about all the sections of your journey. These are great tools for route planning. As I alluded to above there are context sensitive menus depending on the current mode of operation. With no route planned you have the planning menu with Drive to; View Map; Plan Route; and Help. These all allow you to select a destination in a number of different ways. On the other hand when a route has been planned the main menu gives you options to manage the route: Change Route; View Route, Clear Route; and Help. Having planned and plotted your route it is now time to drive. When you are parked the GPS does not know which direction you are facing until you set off. Once you do it will work out what direction you are travelling in and will have a 50-50 chance of getting it right. If not then you will automatically be redirected to get back onto the correct route. The same happens if you take the wrong turn or indeed miss your turn. The TomTom Start will work out the fastest way to get you back on track again with a quick re-route. When you are travelling along the road you will be given spoken instructions for each manoeuvre that you need to make. 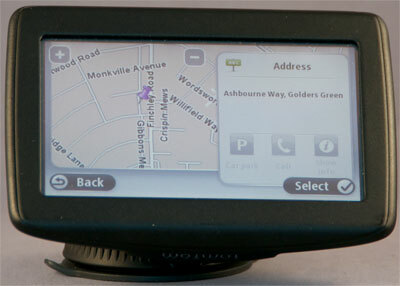 With the TomTom Start 20 you get text to speech instructions that allow the SatNav to read out the street names. This is quite convenient when driving in traffic on busy streets as it means that you do not need to take your eyes off the road to select the correct road to turn into. The quality of the speaker and thus the voice command is not that good. It is certainly clear enough, but it not a quality sound. I suspect that this is a limitation of the speaker hardware. Interestingly it sounds better on my desk than it does in the car. However I don't drive my desk I do drive my car. When you are driving along major roads there is also a feature known as Advanced Lane Guidance to help you select the correct lane. This is displayed in the central display area at the bottom of the screen. Typically there will be a number of arrows representing the lanes, with the ones that you should be in displayed in white, and the ones you should not be in shown in grey. When you approach major junctions the entire map screen is replaced by a graphic depicting the road layout with your lane clearly highlighted. In theory the updating of the SatNav is simple. I am a real believer of buying a device that has the latest information on it, but I do appreciate that software and maps change. TomTom understand this too and have provided the capability for you to connect the Start 20 to your computer and download updated software and maps. To do this you simply unplug the power cable from the cigar adapter and then connect the cable to the USB port of your computer. You are then prompted to visit www.tomtom.com/getstarted. This asks for your preferred language and then sends you to a page to get the software you need to do the update. All well and good so far. The download page shows the devices that work with the system and this is where the problems start. 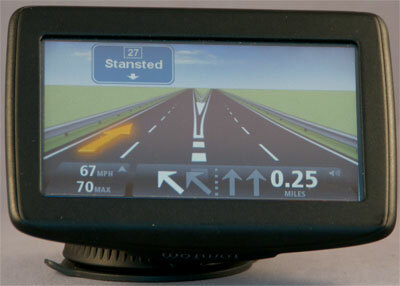 The Start 20 is not shown as one of the supported SatNavs. The website has recognised that I am running on a Mac which is nice (and accurate) but I cannot download the software as my device is not supported. Wait a second, just under the download button there is a link for a different device we are getting somewhere� This lets me download TomTomHome2winlatest.exe. Hang on a minute didn't the web page recognise that I am using a Mac??? Not to worry there is another link that allows me to change the operating system. I click that and I am offered� Yes you guessed it TomTomHome2winlatest.exe. I was just about to give up but decided to see if I could find the Home2 software somewhere else on the TomTom site. While I was looking for it I inadvertently clicked on a support link that suggested that the Start 20 was indeed one of the supported devices. I duly downloaded the software and installed it. Wonder of wonders it actually worked. TomTom was installed on my computer. I now have a TomTom icon in my top menu bar. Initially I clicked on 'MyTomTom' and 'Add Community Content' and nothing happened. Clicking on Settings and close both worked so I assumed that something was working. It was at that point that I went back to the TomTom website and noticed the MyTomTom on the right of the menu bar. Clicking on this recognised my Start 20 and took me through a registration process. At the end of the registration I discovered that I needed an application update. The application update went surprisingly smoothly. The software was automatically downloaded from TomTom to my computer, and when on the computer the Start 20 was updated. All nice, easy and idiot proof (other than the fact that I had to flail around and find things out by experimentation). My SatNav now reports an App dated 3Aug11 and maps Apr11. Surely there are later maps than that? It would appear not TomTom says I am up to date. After the ease of the software update I decided to try and add some POIs. One of the great things about TomTom SatNavs over the years has been the ability to create and install custom POIs to the device and tailor it to your way of working. TomTom now call this Community Content. Much as I would like to report that I have downloaded my bespoke sets of POIs I am afraid that I cannot. the software to update the device simply does not work. At PocketGPSWorld we have been critical of the TomTom Home mechanism to control the content on the device, but the newest incarnation appears to be even worse. 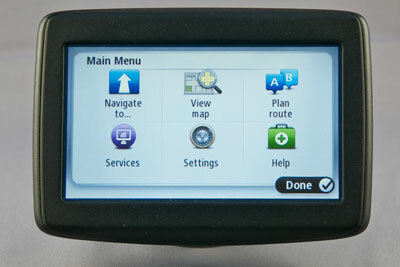 As of 24Aug2011 TomTom have released a new version od the TomTomSA app and POIs now work as expected. One other consideration you need to be aware of. We always advocate that people should back up all their electronic data. This ranges from documents to emails and of course your SatNav. How do you back up the TomTom Start 20? Err you don't!!! TomTom do not provide any facilities to ensure that your data is saved and available if you should need to recover it. This section may be a little unfair for an entry level device as there will be a lot of functions missing compared with the premium ranges. Having said that it is useful to know what you get with more expensive devices. There is no bluetooth. This means that the GPS cannot be used as a Hands Free phone. This is not a great issue as I have had SatNavs with hands free functionality and not been happy with them. Another feature that is not implemented is the Bluetooth A2DP protocol meaning you can stream the voice commands to the car stereo. Many new cars come bluetooth equipped nowadays and being able to have the voice instructions over the car radio is a good feature. There is no Traffic data as standard. One of TomTom's big selling points is the HD Traffic service. HD Traffic is not available for the Start 20. However for an extra �50 you can buy a special power connector that implements a less able traffic system. 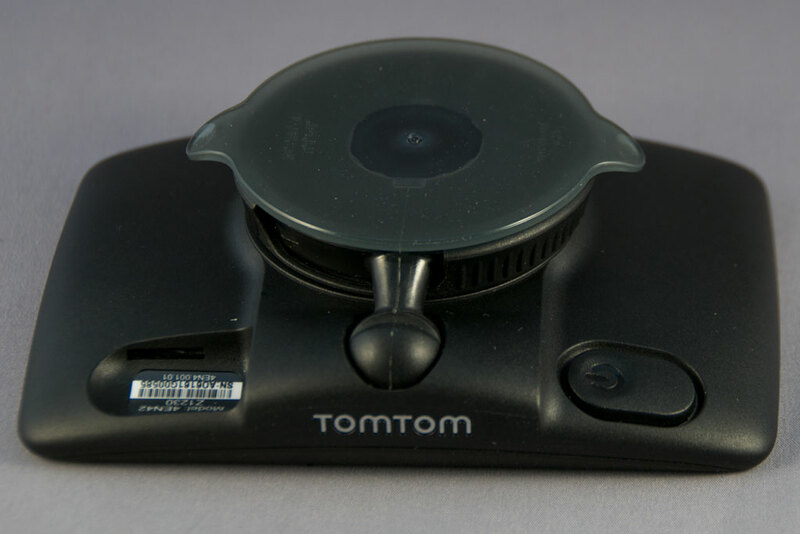 However if traffic is important to you it may be preferable to look at one of the TomTom Live devices which work out at about the same price as the Start 20 plus Traffic adapter, and for that you get TomTom HD Traffic. No Live Services. Again this is restricted to the more premium devices and provides Google Local search, Speed Cameras, HD Traffic, Weather etc. This may not be of much use to a novice, but the Google Local search has often found places for me that were not in the Points of Interest database. Voice commands. A feature of the top of the range TomTom SatNav devices that allows you to operate your system by voice alone. I have been messing around with GPS systems for over 10 years now so I thought it would be a good idea to give the TomTom Start 20 to someone not quite so familiar with SatNavs. After using it for a number of weeks they reported back. The main comments that I received was that is was easy to find places, but that it seemed quite slow and not very responsive at times. The mapping was accurate for the trips that were undertaken both commuting and driving to unknown locations. They liked the fact that the Start 20 could be taken off the windscreen and placed in a pocket (or handbag) closing to just 1 inch thickness. They didn't like the screen very much. Although there was not the reflections that you see on the conductive glass screens they found that you had to use quite a bit of pressure for screen taps which meant that often some were missed which inevitably meant backing up or deleting. 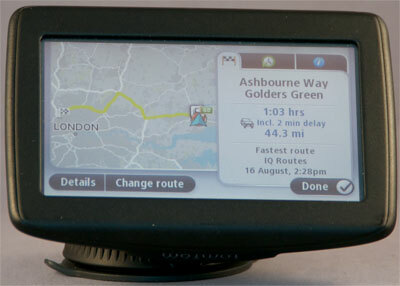 Overall they declared that it was a very useful tool and would be happy to buy it if they ever needed a new SatNav. 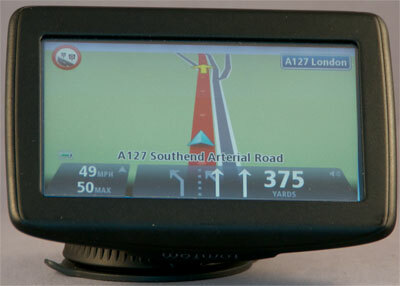 As an entry level SatNav the TomTom Start 20 is a good device and a reasonable performer. Bearing in mind that it is an entry level device then the missing features are not critical to the targeted market. If you want a device that you can use out of the box and never take near a computer then this could be the SatNav you are looking for. 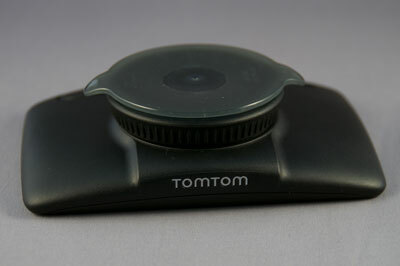 It has the strength and pedigree of the TomTom brand. This is evident in the easy to use navigation, the good routing, clear and easy to follow navigation instructions etc. The device is clearly well made and a good deal of thought and effort has gone into the design. I have some reservations about the quality of the audio output in the car, but overall it is a good and reliable SatNav. What does let it down though is the ability to customise the contents. TomTom has traditionally been very open with their software allowing 3rd party content. This has indeed been one of the big market drivers. Sadly they have now shut down access to the SatNav memory and not provided an adequate means of adding content. Unfortunately it appears as if TomTom have introduced a device to the market which on its own is a worthy contender, but lacks the systems support to make it a 'complete' product. with automatic screen viewing rotation. Good for boy racers who end up on their roof in a hedge then? Oh, and I forgot to say another good review by the way, as usual. my recently purchased live 120 seems very similar but with some of the missing features like live traffic, bluetooth and google search which I have found very useful. My only moan is that the screen really isn't bright enough when the sun comes out. I also found the mini usb connector a real fiddle being so tiny. I bought a 2 inch mini usb to usb connector which I leave connected which makes storage easier, then just hook up a normal usb cable to supply the power. and as a Windows user I've had no problem adding the speed camera database and a few other POI's. HD Traffic [which is not what it was] is the only reason to buy a Tomtom, so why buy one without it? The MyTomtom limitations, seem to me, to make other satnav manufacturers' non-live models more user friendly at the moment. Indeed if you want traffic you are better off getting the 120 than the Start 20 and RDS-TMC traffic adapter. With the Start 20 as far as I am aware neither Mac or Windows users can add POIs at the moment. Are you sure about that Mike? I don't have my Start 25 currently to double check it still can, but I thought with the latest version of MyTomTom and one of the latest Navcores, ALL NAV3 models could now add POIs and other user content. TT seem to think so too, as the Start 20 series models are mentioned here. Maybe aesthetic was the word you were looking for to describe it's looks. However a good informative article and that apart give me Tomtom any day of the week, as long as you know which model you are getting. That is the problem with having so many to choose from. I originally bought the 520 as I was seduced by the additional technology- Bluetooth, TomTom services, traffic, mp3 player, ability to link to FM radio etc. However, when I came to assess what I actually needed it for I realised I needed a Sat Nav to get me round the country for my work - I'm a rep who does many business miles. The only extras I needed (for that read 'used') was the Speed Cams from Pocket GPS and other POI's, all of which are uploadable to the Start 20. I'm actually really impressed. It does what I need and, although the text to speech spoken POI warnings mean I can't be accompanied on trips by the real voice of Vicki Archer, it really works. If you need a 'cheap' dedicated sat nav with no pretences to get you round with a few extra bits then I recommend the Start 20. TomTom have released a new version of the TomTomSA application for your computer and POIs can now be loaded onto the Start 20 from your Mac. The review has been updated to reflect this.